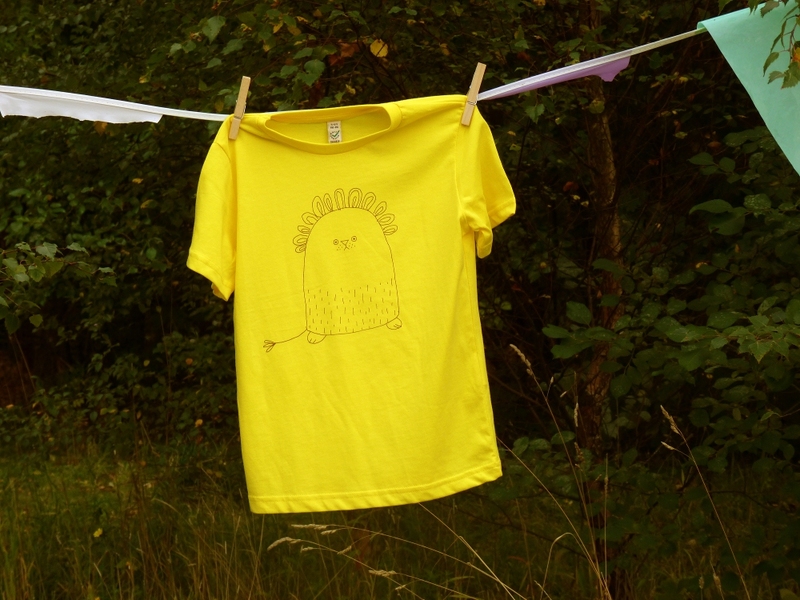 Kim is the illustrator and maker behind all the wonderful Poosac creatures. Kim has created a design for Mimi and Will based on her ‘Freckles the Lion‘ toy. 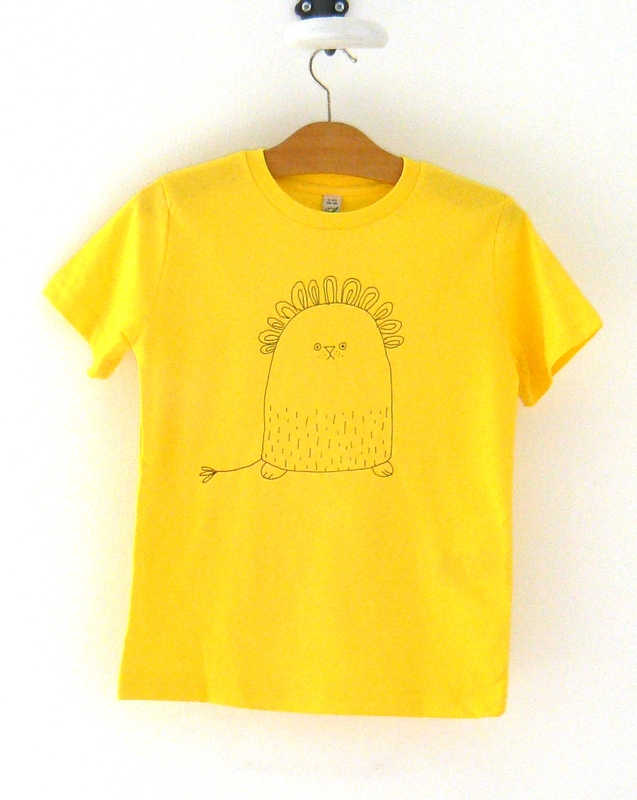 The design is taken from an original illustration by Kim, and is screenprinted on a yellow shirt. Well hello again! We’re quite the ones for exciting updates, no? 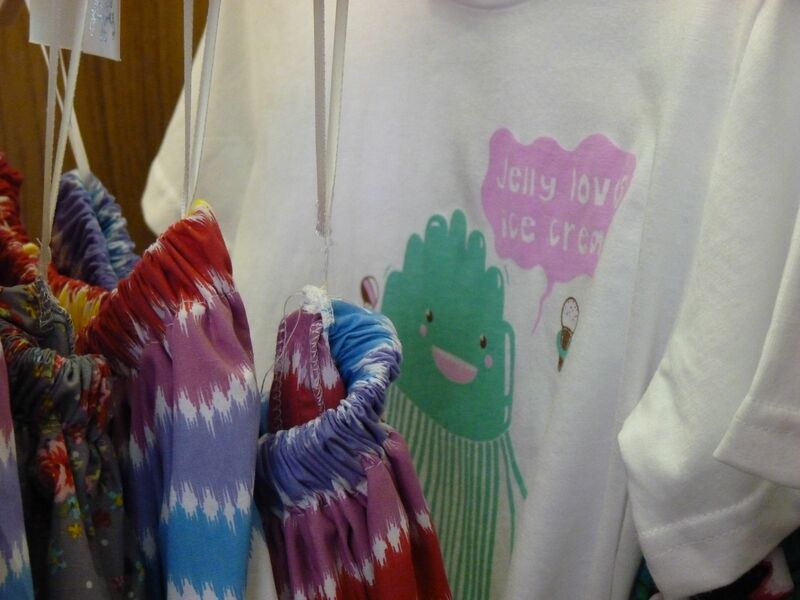 We can now confirm that the sixth designer collaborating with us is Jodie Clay, of Jolly and Hodie. 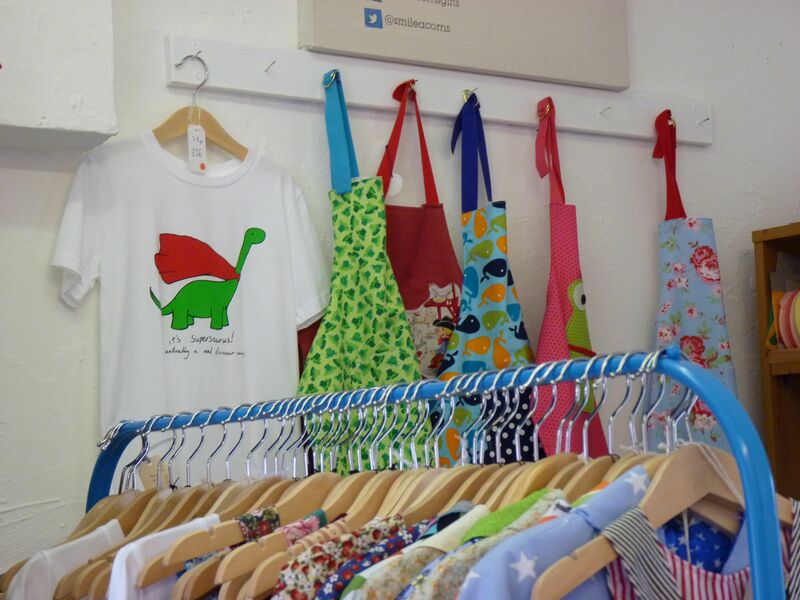 Jolly and Hodie is a childrenswear range, designed and crafted by Jodie. The clothes are created using traditional crafting techniques such as patchworking, and the patterns are drafted by Jody from original 70s blocks. Find Jolly and Hodie on etsy and folksy. This is a proof of Jodie’s design for Mimi and Will. 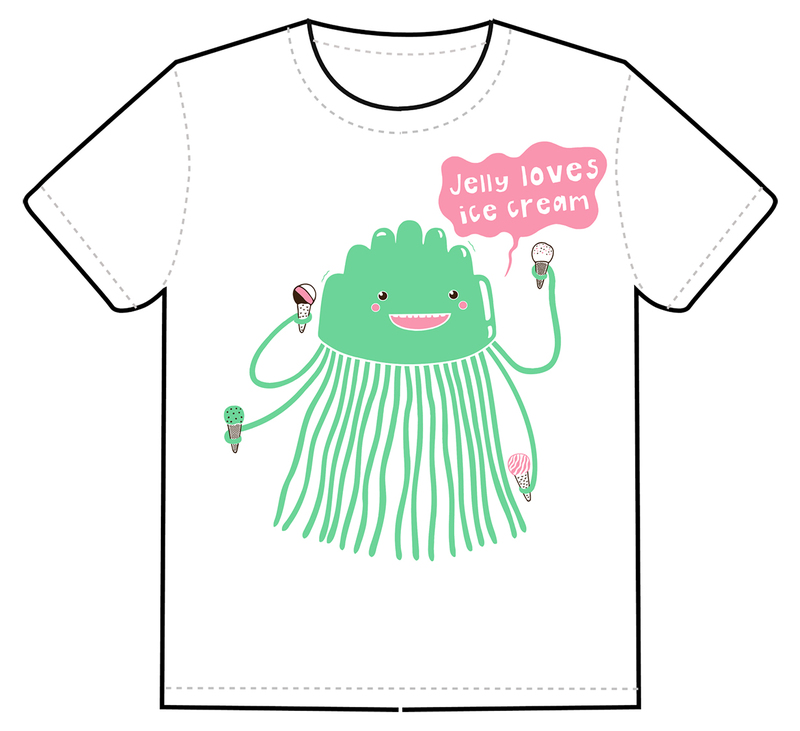 And talking of proofs, here’s the proof of Lucy Farfort‘s design, Jelly Loves Ice Cream. Excited? Head on over to Mimi and Will’s Indiegogo page and place your orders! Good morning! 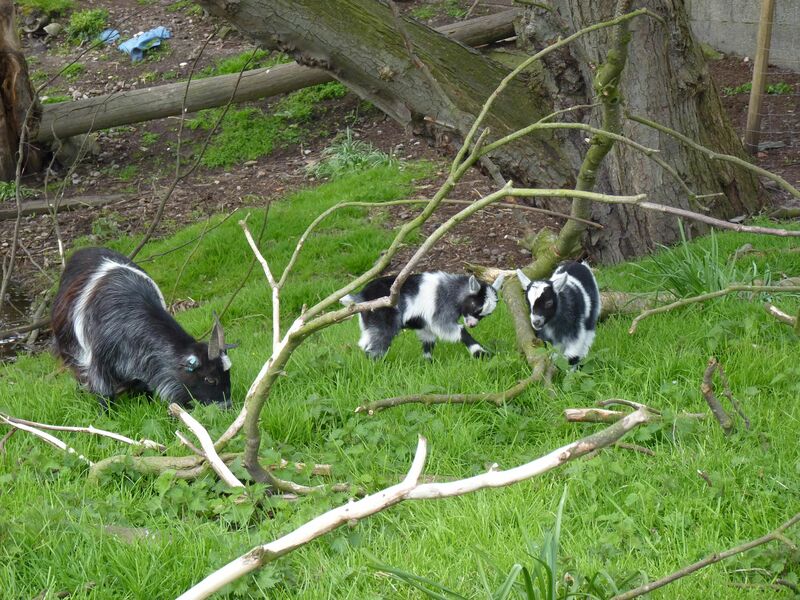 Welcome to anyone who’s recently found us through Facebook or twitter. I hope everyone’s looking forward to the weekend. We’ve apparently got ‘approaching cold fronts’ here in Glasgow- you types down south better remember your sunscreen though! A couple of updates from Mimi and Will HQ for you; firstly, we updated our campaign page on Indiegogo to make the t-shirt ordering process clearer. In a nutshell, you choose the number of t-shirts you’d like, and click the relevant reward (one, two, three or four t-shirts). You don’t have to give us your design preferences or size information yet. Towards the end of the campaign, we’ll contact you to get your sizes and choices. We’ll get all orders to the printer and you should receive your shirts at the end of November, in plenty of time for Christmas. We’ve also added another reward to our Indiegogo page. We now have ten shirts available at £15. There are only ten though! 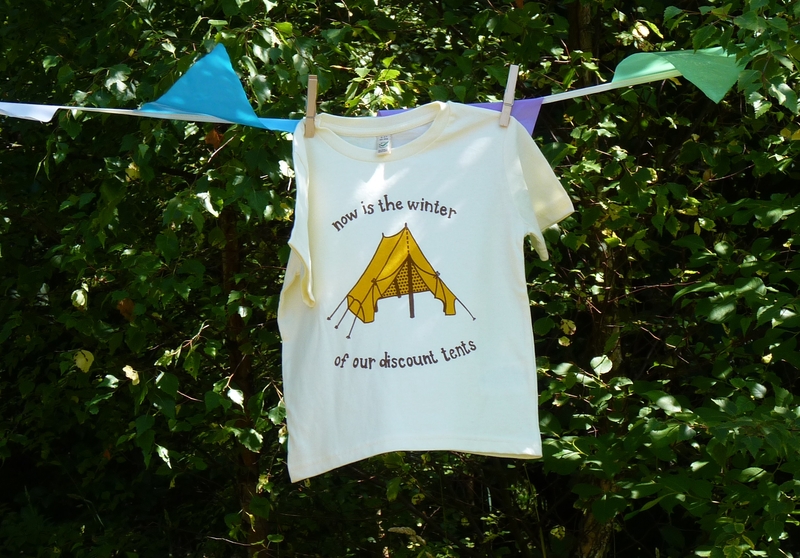 Our second design is ‘Winter of Our Discount Tents’ by Laura Donald. 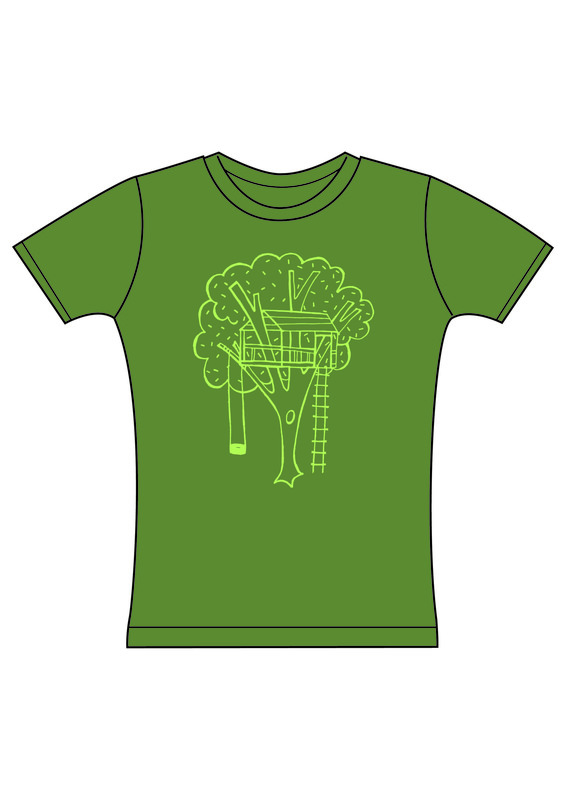 This was an existing design that Laura had, that she’s licensed to us for children’s shirts. We’re offering in it yellow and brown inks, printed on a natural/ white organic tee. Laura blogs at dropstitch. As well as having mad illustrating skillz (as the young people, er…, don’t say), she’s a sewer and a crafter- you can check out some of her projects on her flickr stream. She also apparently used to be in a band called Annalise And The Messiah. Oh yes. Read about it on dropstitch.